It's hot here, the suns shining, and schools out in less then a week. Can school really be out already? Didn't it just start? I went through that reality moment last week we are only a few blinks away from Lorna graduating High School when she told me they already had a moving up ceremony, and she's now a Sophomore. I was just getting use to the idea she was a Freshman, I'm not sure this Mom can handle this! Can't I shrink them back into little people with kissable toes that like to snuggle on the couch? The cool thing about the kids getting older is I can look back and realize we've done a pretty amazing job with the kids even if half the time we've been flying by the seat of our pants. So with the beginning of the first day of summer almost upon us I am officially craving Waldorf Salad. It's one of those classic picnic or potluck dishes that was a standard dish at family gatherings. 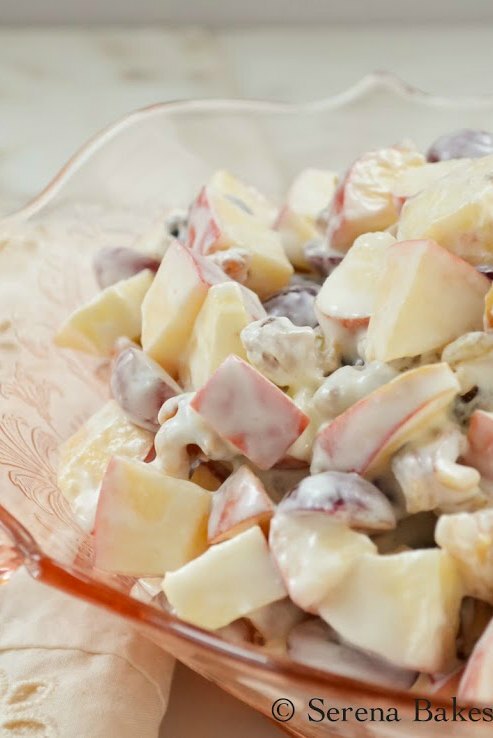 I remember my Grandma Lorna whipping up Waldorf Salad for family picnics on a few hot summer days. I lightened this classic dish by cutting back on the mayo and adding greek yogurt. If someone had told me there was mayo in this dish before I tried it I probably would have turned my nose up and run the other way but trust me it's delicious! I've never been big on mayo but it makes for a deliciously creamy dressing with a nice tang that really pulls the flavors of the sweet raisins, apples, grapes and walnuts together. Then in memory of my Great Grandparents I decided to pull out the depression glass bowl Grandma Lorna gave to me a few years beck that she inherited from my Great Grandma Sachs. I think my summer goal will be to fill this bowl with gorgeous food instead of hiding it in the china hutch since every meal should be a celebration. In a large bowl stir together 2/3 cup Greek Yogurt, 1/4 cup Mayonnaise, 1 1/2 teaspoon Honey, 1 tablespoon Lemon Juice and a pinch of Sea Salt. I find the lemon juice brightens the dressing along with the pinch of salt. Add 4 whole Seeded and Diced Gala Apples, 1 1/2 cups Sliced In Half Seedless Red Grapes, 1/3 cup Golden Raisins and 1/3 cup Roughly Chopped Walnuts. Mix with dressing until well combined. If serving at a picnic remember to keep salad cold since it does contain mayo. Serve in your favorite dish and enjoy! Such a pretty and easy to make side perfect for those summer parties where you need something quick and easy to make! 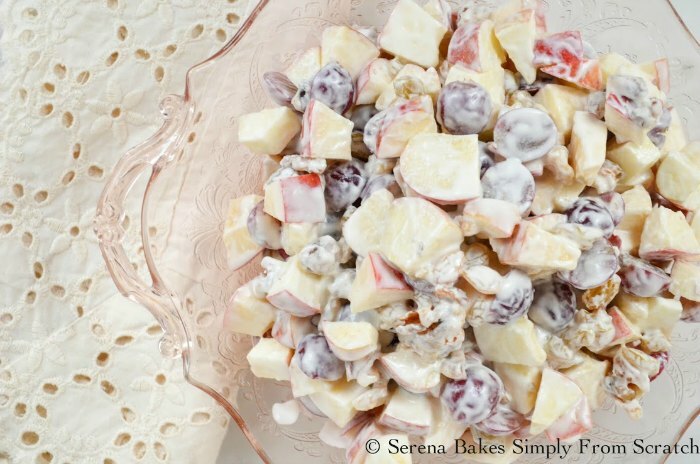 A lightened version of the classic Waldorf Salad and perfect for gatherings, picnics and potlucks from Serena Bakes Simply From Scratch. 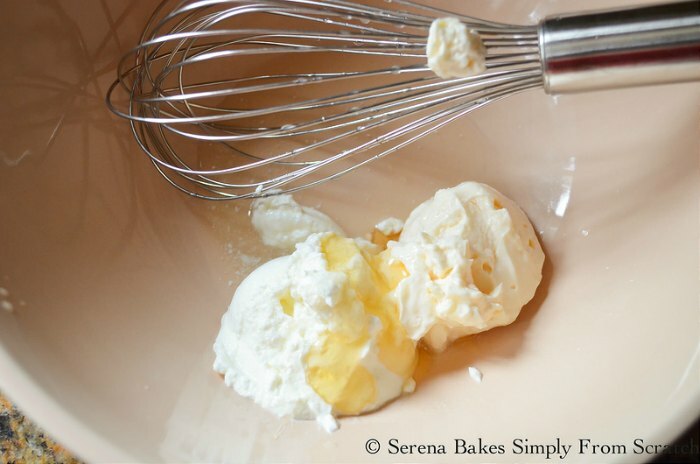 In a large bowl whisk together yogurt, mayonnaise, honey, lemon juice, and a pinch a salt until well combined. Add remaining ingredients, and stir until well coated. This looks delicious, Serena! I love the addition of greek yoghurt. 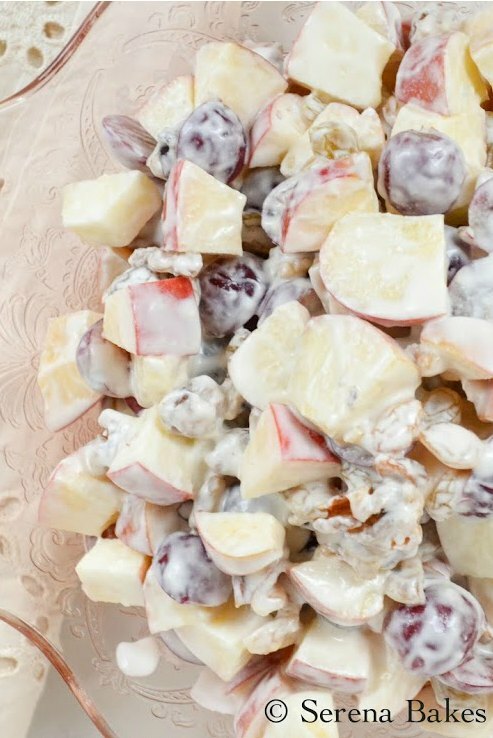 Love Waldorf salad, and love how you lightened it! Greek yogurt is the bomb! :) Nice! This looks really nice. I love to substitute Greek yogurt. You truly save calories without sacrificing taste. This is what I call a perfect summertime salad. 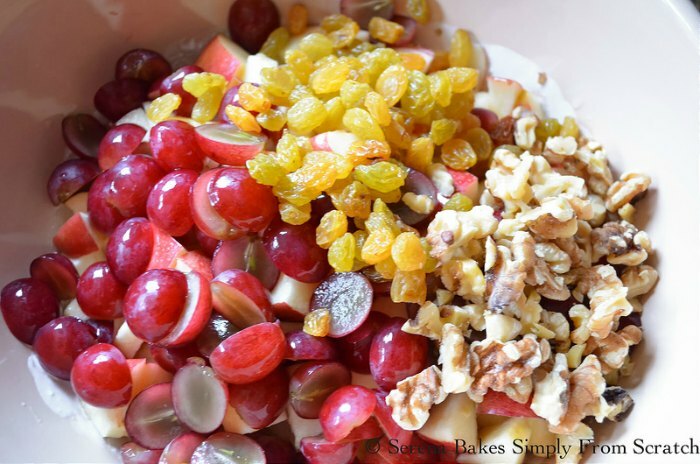 I am a big fan of Waldorf salad and yours looks healthy and delicious!